We are pleased to share with you that the Night of Adventure series will be making a very special appearance at Level39, for an exclusive evening filled with adventure in aid of the international children’s charity Hope and Homes for Children. Join us in Space39 for a welcome drink and then move to the Sandbox to hear from an eclectic collection of first-class adventurers from across the spectrum of explorers, daredevils and pioneers as they share their experiences. Each speaker will be limited to just 20 slides to accompany their tales, each slide leaving the screen after just 20 seconds. It’s fast. It’s furious. But ultimately, it’s a chance to be swept away to a world filled with adventure, all without leaving your seat. 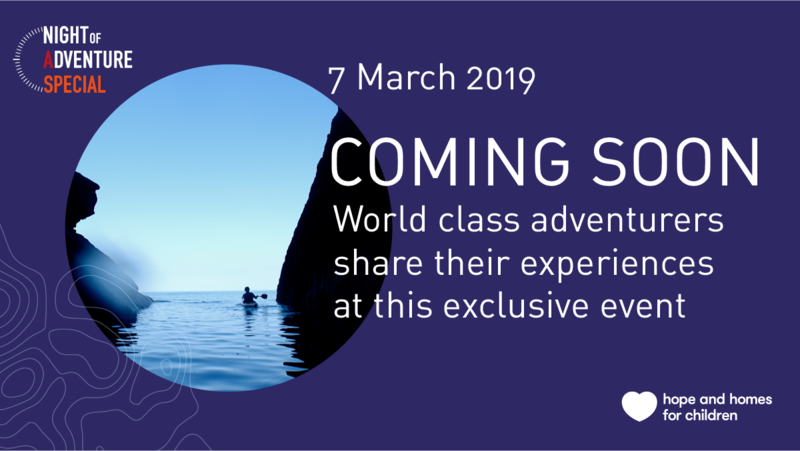 Alongside an exciting line-up of speakers, the night will be hosted by author and record-breaking adventurer, Dave Cornthwaite. Whether you are interested in global adventure, pushing the limits of what is possible, or simply seeking out adventure with friends and family closer to home, there should be something for everyone. For more information and to book your tickets simply visit the private event page. If you have any questions please contact the Hope and Homes for Children team at community@hopeandhomes.org or by calling 01722 790111.